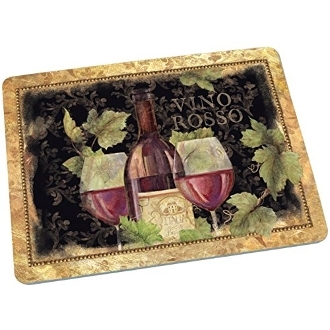 Use the Gilded Wine Large Glass Cutting Board to chop slice or dice fruits veggies meat and more. This versatile design makes a great addition to any kitchen and can be used as a cutting board or a trivet. The attractive wine bottle and glass design features a gilded gold border which adds simple and sophisticated style to any home. Not only will the large glass cutting board make a great addition to your own kitchen it also makes a great housewarming or newlywed gift. Use to chop slice and dice fruits veggies meat and more. Versatile design can be used as a cutting board or trivet. Attractive wine bottle and glass design with a gilded gold border.